The Cubs came to town to play the Nationals last July. As a Chicago North Sider by birth, I refuse to miss any Cubs-Nats games played inside the Beltway. As luck would have it, I showed up at the Bullpen beer garden outside Nationals Park before game two of the Cubs-Nats series; the same night Midnight Spin happened to be the entertainment on tap. I remember it like it was yesterday. A friend of mine and I were a few lite beers into our evening about an hour before game time when out of the loud speakers rang the opening chords to Steppenwolf’s “Magic Carpet Ride” à la Midnight Spin. It was love at first listen. Beer induced love is a pure love, at least in my experience. My friend bet me that I wouldn’t remember the band’s name in the morning. That friend was wrong. Unlike a beer induced one-night stand, not only did I remember their name, but I wanted a second date. That second date took place in October 2009 at The Velvet Lounge. Since then, it’s been a whirlwind romance. My instincts didn’t lie. Midnight Spin was worth the beer induced love affair and my continued devotion. These guys are on a roll. Since the Velvet Lounge gig, Midnight Spin has been hard at work promoting their debut five track album Through the Mojo Wire (available on iTunes), recording their first full-length music video produced by some of MTV’s finest, launching a new website, sharing the stage and rocking the mic with Axl Rose, and traveling due to a rigorous tour schedule. They’re also Deli Magazine: Best of NYC Reader’s Poll - Best Emerging Artist 2009, Band of the Week on “Rock it Out!” the blog, Sonicbid’s March 2010 “Artist2Watch“, and even had a song featured during a montage for the Philadelphia Eagles on ESPN’s Mike and Mike in the Morning. In short, Midnight Spin can be described in two words: radio ready. Through the Mojo Wire proves it. Through the Mojo Wire screams “quality over quantity can be a musical reality”, but with Rock and Roll instrumentation and song structure instead of anger. The desire to sift through songs via your iPod’s shuffle function will cease to exist after pressing play. Each track has the ability to become one of those catchy Top 40 songs played on DC101 once an hour, every hour, that never gets old despite continual air-play. That in itself is a demonstration of good work. Here’s the skinny: Midnight Spin hails from New York, runs deep with D.C.-metro area blood, and packs every venue they play with fans that shake the dance floor while demanding an encore until the wish is granted. They’re also the band whose songs are sure to be stuck in your head for hours on end. They weren’t lying when they said, “We can re-write history too” (lyrics from “In The Air (Revival). So far, so good. Rachel: Midnight Spin recently released a music video for “In The Air (Revival)” at The Library in New York City, what was it like to see your faces up on the big screen while surrounded by family and friends? Ben: We felt like movie stars. It’s funny because you don’t see these kinds of things down the line when you start a band, but once you get to that point, you realize that we really are living out some pretty surreal events, and it feels good. Mike: It was a great moment. Aside from just realizing how far we’ve come, it was really cool to see a bunch of friends, fans, and collaborators rallying around our band, and just supporting us the whole way. Our fans are the best. Rachel: Every time you come to DC, you seem to be getting bigger on the local venue scene — Gin and Tonic, the Bullpen, Midtown Loft, The Velvet Lounge, DC9, Rock and Roll Hotel, then the Rookery later this month — what’s the next DC venue you want to play at? Jeremy: When we were in DC recently, we stopped by the Black Cat after hours and thought it was a great spot. We could be playing there soon, we’ll see. Rachel: Favorite DC gig since you started playing here? Danny: 8th grade talent show, Silver Spring MD, 1998. Brought the house down. Standing ovation from the entire school. Mike and I were rocking the DC area when our moms were still driving us to basketball practice. Ben: Velvet Lounge was great because there were so many people there. But the Bullpen was fun too when a bunch of rowdy Canadians and an Umpire hopped on stage and called Jim out while sliding into home. Jim: I’d say Velvet Lounge. Crowd energy was over the top…(crowd energy is really the main thing driving a great show for me) and a line out the door makes you just simply that much more excited to perform. Truly a great memory. 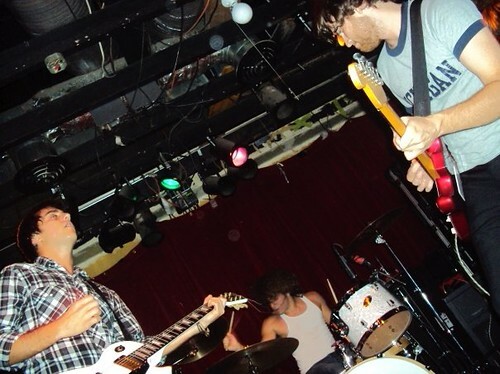 Jeremy: Parkers in Bethesda; my very first gig with Mike and Danny in late 2007 while I was still in college, before Midnight Spin even existed. I thought they were both lunatics, but damn they could play. 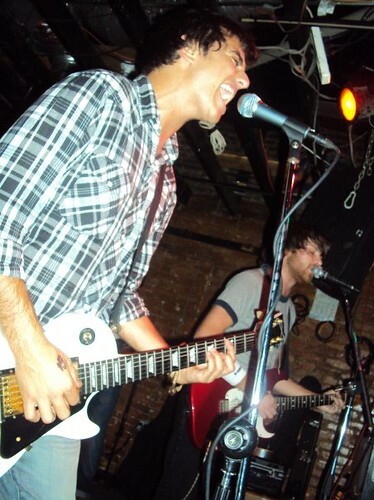 Mike: Velvet Lounge was pretty great, it felt like the floor was going to cave in. Rachel: Dream DC venue to play at as a headliner? Jim: 9:30 Club…Or how bout as an opener for a MAJOR band at the Verizon Center? I think I’d prefer that. Mike: Gotta agree with Danny, 9:30 Club has always had a stature to it, and it just says a lot to be able to play there. But I would cry if we got to play an HFStival. Bring it back! Ben: I’d like to play on a stage in Center Field at Nationals Park. Rachel: Favorite place for late-night DC eats? Danny: I loved the meat pies at AKA Friscos on Wisconsin… I think that place got shut down though. Ben: Anywhere as long as there is pizza. Mike: Quick Pita in Georgetown. The Quick Pita Special has been there for me every time I needed it at 2:30 AM. Jim: ZBurger Onion Rings hit the spot. Rachel: As a kid, what did you want to be when you grew up? Jim: Joe Montana, QB of the 49ers. 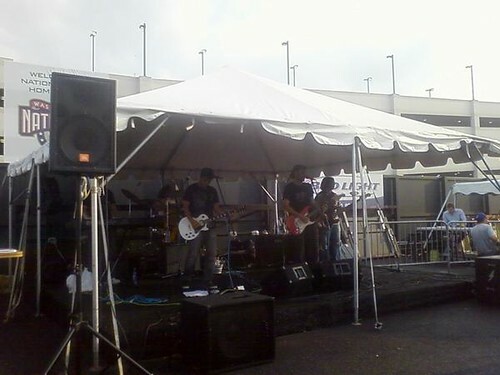 Mike: Apparently I wanted to be a guitar player. My mom showed me a picture I drew when I was 5 years old, of a Gingerbread Man with a guitar. It was titled, “Gingerbread Rock and Roller”. I’m waiting on some callbacks about being turned into a Gingerbread Man. Jeremy: A basketball player, namely Shaquille O’Neal. I did a project on him in 3rd grade, and demonstrated how to dunk while breaking the backboard using a Koosh ball and paper plate. Ben: I wanted to be a baseball player, an astronaut, or president, but eventually I settled on rock star. Rachel: Would your kid-self be happy with this whole Rock Star “thang”? Jim: My kid-self would want to know why he can’t buy all the video games he wants just yet…but other than that he’d be pretty excited. He’d probably write a song about it. Jeremy: Absolutely. Though, he would be very upset we haven’t sampled any Disney themes or Looney Tunes jingles. Ben: My kid-self would be upset that I don’t watch cartoons as much anymore. Mike: I think my kid-self would probably agree with it quite well. We get to stay up very late. Danny: I think I still am a bit of a kid-self… and yeah, my kid-self is psyched. Let’s boogie. 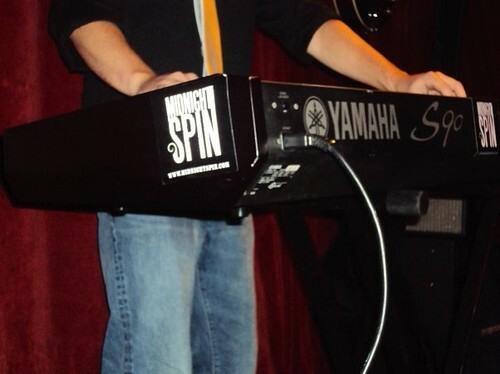 Midnight Spin will be headlining the Rock & Roll Hotel Friday, April 2. Doors open at 8, Midnight Spin goes on at 11 and tickets are still on sale for $10 (you can also pay at the door). If you can’t make that show, the boys will be back in town for a stint at the Bullpen on April May 7 starting at 9:30 p.m. Midnight Spin: In The Air (Revival) from Midnight Spin on Vimeo.